Wrapping bars - When did we switch techniques? I seem to remember when I first got into cycling in the early 70’s we would wrap our handlebars starting at the top, doing a figure 8 at the hoods, then finish off at the bottom using a barend plug to secure the tape. No tape at the top. Now we start at the bottom, maybe figure 8 at the hoods but usually a small strip of wrap is used, then finish off at the top and secure with tape of some kind, usually electrical tape. A younger rider, mid 20’s, asked me and I told him I couldn’t remember. I've always found that if you start at the top, if you ride with your hands on the tops the tape will have a tendency to roll at the edges a bit. Doesn't happen if you start the tape in the drops. If you start at the top, the "grain" is the wrong direction and you'll start rolling and separating the tape when you grip the bars. 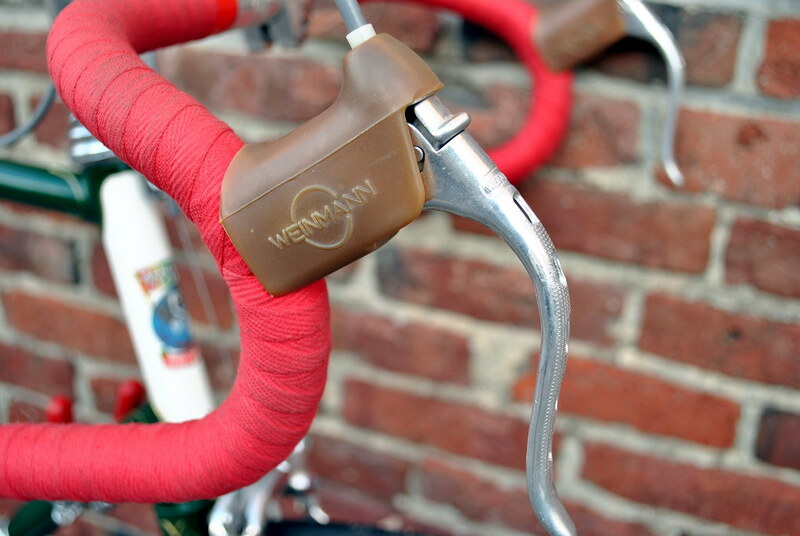 Handlebar wrap is more of an art than a science, and there's no single way that it's been done over the years. 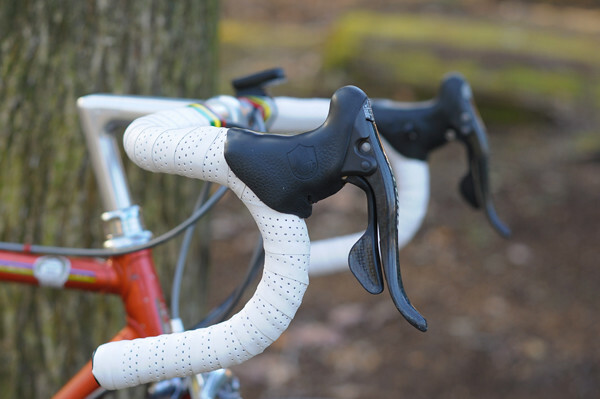 And sometimes not all methods are practical; for instance, bar-end shifters make it problematic to plug the tape at the bar end. Some bikes built by Alex Singer back in the day have tape wrapped both bottom-up and top-down: one piece of tape would start at the top, one at the bar-end, and they'd both end at the brake hood. Anyway, the primary reason that modern tape is almost never wrapped top-end is that it reverses the direction that the "edges" of the tape are facing. In places like the ramps behind the hoods, the result is that the hand is more likely to catch on the tape edges and curl them up. This isn't much of a problem with cotton cloth tape because it's very thin and stiff, so the edge is small and won't budge. But modern tapes are much thicker and usually more stretchy. I agree that figure 8 wrapping around the shifters is quite tough with today's tapes. These days I don't even bother to put a small piece of tape in there to cover over the shifter clamp. I find that the tape tucked under the hood makes it bulge a bit and I don't like that. With some careful wrapping with a wider tape (like Zevlin Big 40) I can wrap around the shifters and only leave a very tiny bit of the shifter clamp exposed. Good enough for me! ...Now we start at the bottom, maybe figure 8 at the hoods but usually a small strip of wrap is used, then finish off at the top and secure with tape of some kind, usually electrical tape. Been riding since the early eighties. We always started at the bottom, did the figure 8 thingey at the brake levers, and then finished at the top with electrical tape. Wrapping your way causes the tape to unwrap and show sections of bare bar. So the switch must have been sometime between early 70's and early 80's. With cloth tape, I start at the top and wrap over the brake clamp before the lever is mounted, then tuck the ends into the bar and use bar end plugs. With modern tape, I start at the ends and wrap up, finishing with tape at the top. You can't finish cloth tape with electrical tape, and I got no time for twine. I find either method works for me, never had a problem with tape not staying put. Mee too exactamundo. Never saw, heard of, or tried wrapping top down. Brake lever extenders, shifters on your quill, plastic saddles. Don't get bent out of shape. Is there an old "How To" cycling book that you are referring to that instructs middle to end? Top down? What the? Old enough I should remember but do not. I thought this thread was going to be on tape out or tape in. I am a tape out guy. Right side clockwise, Left side counter. There are some pros that wrap top down, so there is no electrical tape on the bars. But I don't have a mechanic to change it every ride, so I go bottom to top.